Leonard Nimoy's Mr. Spock Taught Us Acceptance Is Highly Logical The Star Trek actor died Friday in Los Angeles, and NPR TV Critic Eric Deggans says Nimoy's signature role taught fans the power of accepting their differences rather than fighting them. For this Star Trek fan, Leonard Nimoy was more than the guy who played one of the most popular characters in the most popular science-fiction franchise on American TV. He was a serious actor whose journey to accept his unique fame mirrored many fans' personal struggles for acceptance — particularly back when science fiction and fantasy weren't quite so cool. He was the guy whose status as the half-human, half-Vulcan Mr. Spock — a brilliant, capable officer from a race of aliens who suppress their emotions — would eventually be validated by the world's embrace of geek cool. And he was the guy whose eventual acceptance of Star Trek would make him the fan-friendly yin to the yang of Trek actors who seemed to have a tougher time embracing the show's legacy (yes, Mr. Shatner, that's a reference to you). Even President Obama, who is sometimes called Spock by some pundits for his own distant cool in a crisis, gave props to the actor who created his sometimes namesake. "Long before being nerdy was cool, there was Leonard Nimoy," the president said in a statement. "Leonard was a lifelong lover of the arts and humanities, a supporter of the sciences, generous with his talent and his time. And of course, Leonard was Spock. Cool, logical, big-eared and level-headed, the center of Star Trek's optimistic, inclusive vision of humanity's future." Nimoy's acceptance of his Trek-fueled fame seemed to affect how he played the character in later years, both on the syndicated show Star Trek: The Next Generation and in movies. In these settings, Mr. Spock morphed from a conflicted outsider who often wore his alienation on his sleeve to a character who serenely embodied his conflicting natures, almost savoring the inconsistencies of his human friends. Leonard Nimoy's Photography: Let Your Secret Nerd Rejoice! Leonard Simon Nimoy died Friday at 83 of end stage chronic obstructive pulmonary disease. He leaves a long legacy as a performer, artist, musician and writer, but he'll always be known to legions of fans as Mr. Spock, first officer of the Starship Enterprise. The original Star Trek was a short-lived NBC series about a space-faring starship crew that was canceled in 1969 after three seasons, originally described by its creator, Gene Roddenberry, as a science-fiction version of the popular Western series Wagon Train. But the show flowered in syndication, as audiences warmed to the show's adventures and savored its technique of casting modern social issues in science-fiction clothing. Back then, TV shows almost never dealt with social issues directly; while civil rights marches and Vietnam War protests were heating up the evening news, scripted TV shows preferred the make-believe, down-home worlds of Mayberry and Hooterville. Star Trek handled storylines about civil rights and war by setting the stories on faraway planets at a time when humans had mostly conquered their problems. And Nimoy was the show's breakout star, giving Star Trek its best window into a world of cultural conflict, playing a man born of two worlds who was never fully at home in either, at least at first. With angular eyebrows and pointed ears, Spock had an elvin look that matched his precise efficiency. But he was also a coolly superior figure, working to understand his human colleagues even while remaining smugly sure he was above them all — a really appealing character for misfit fans looking for similar assurances. As a young black man and science-fiction fan, I strongly identified with Spock's struggles to fit in with his human co-workers as I struggled to fit in at mostly white schools and workplaces. And I wouldn't be surprised if other fans struggling to fit into their communities for different reasons felt the same bond. 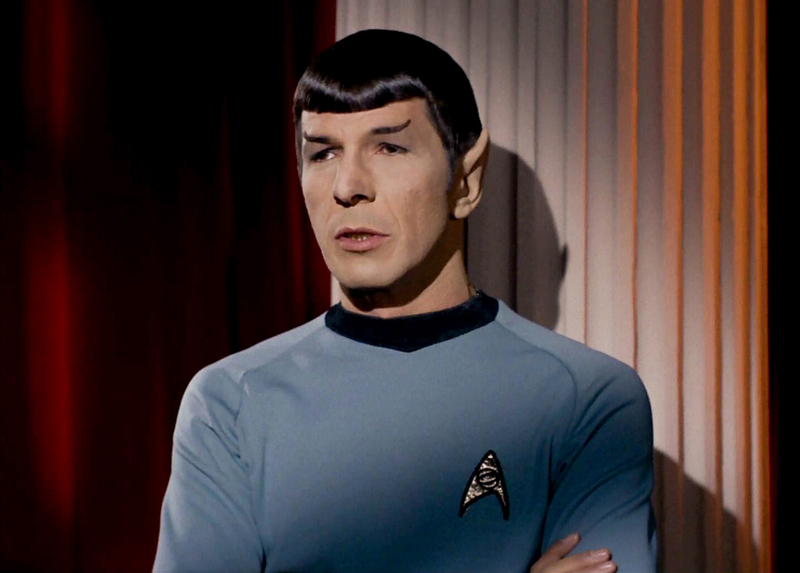 Even Spock's signature hand gesture, a "V" formed with the palm forward, fingers separated between the ring and middle finger, came from the actor's unique cultural perspective. Nimoy, the son of immigrants, raised in an Orthodox Jewish home, said it was inspired by a blessing performed by Jewish priests. Still, Nimoy reportedly had a tough time initially with the typecasting that made it hard for audiences to see him as any other character. Tellingly, when he joined the cast of the spy show Mission: Impossible just after Trek ended, he played a makeup expert who often pretended to be someone else. But as his post-Trek career unfolded, Nimoy would find that the fan love opened lots more creative doors. He released albums as a musician, hosted the nonfiction TV show In Search Of, appeared in the classic 1978 remake of Invasion of the Body Snatchers, and wrote two books summing up his restless relationship with his signature character, 1977's I Am Not Spock and 1995's I Am Spock. "I am not Spock," he wrote. "But given the choice, if I had to be someone else, I would be Spock. If someone said, 'You can have the choice of being any other TV character ever played,' I would choose Spock. I like him. I admire him. I respect him." So it makes sense that, when Paramount revived Trek as a movie franchise in 1979, Nimoy would return to the role, eventually directing the third and fourth films. He also played Spock in an animated version of Star Trek, on Next Generation and in the two recent J. J. Abrams films that rebooted the Trek world with younger actors. Nimoy's Spock in the first Trek film was cold and distant, reluctantly drawn into joining his compatriots to save the Earth. But that man seems a serious contrast to the Spock who would sacrifice himself to save the Starship Enterprise in 1982's Wrath of Khan, telling Captain Kirk, "I have been, and always shall be, your friend." For both the actor and the character, acceptance seemed to bring better, deeper work. Fans who tracked Nimoy's career could see that his creativity reached beyond the Trek universe. His work as a director included the 1987 hit 3 Men and a Baby and The Good Mother with Diane Keaton. And Nimoy kept racking up interesting roles in other places, from Israeli Prime Minister Golda Meir's husband in the 1978 TV movie A Woman Called Golda to the shadowy Dr. William Bell on the Fox series Fringe. He even produced books of photography, including a controversial collection of nudes featuring obese women called The Full Body Project. In the end, Leonard Nimoy was the best example of an artist who took the early typecasting of a popular role and used it to fuel an expansive and creative career — giving fans the treat of seeing his signature character mature in the process. A previous version of this story incorrectly said the movie 3 Men and a Baby was released in 1993. It was actually a 1987 film.